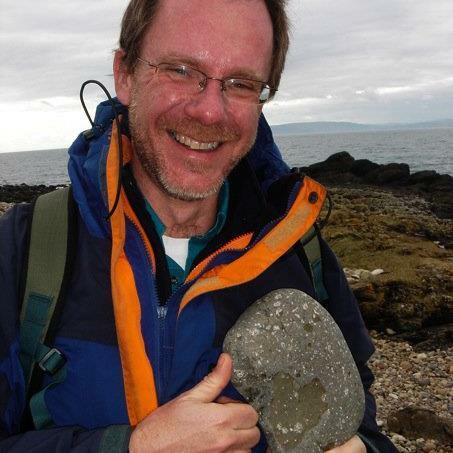 This week in GeoTalk, we’re talking to Simon Redfern, renowned scientist and science communicator and the man behind An Atom’s-Eye View of the Planet. What made you first step into science communication? That’s a difficult question for me to answer, since it is not a step that I have consciously recognised myself making. I suppose that I see science as having at least two sides. One is discovery… posing the correct questions, working out the methods to answer them, and (hopefully) reaching some sort of answer on the basis of your data. But the other side of science forms as big a part of the enterprise. Discovery is worthless without communication. So, as scientists, we labour over how to best present our results and conclusions, typically first through communicating to peers – talks and seminars at conferences, listening to colleagues’ feedback, and then by publishing papers, again with feedback and testing. For those of us working in universities, the next stage of communication is often through teaching, promulgating our science through lectures, review articles, textbooks or (increasingly) blogs. My efforts at more general communication grew out of this. I help teach a first year undergraduate Earth sciences course, which assumes no prior knowledge. Part of our teaching programme uses small group tutorials, and last year I became aware that a lot of geo-news was going on, in the form of exciting new discoveries in the leading papers, or topics of societal concern, that fed directly into the more mainstream core material of the first year course. At the same time, I had started contributing occasional short pieces to a Facebook group called “The Earth Story” – a repository of geological tidbits with more than half a million followers. I started extending my Earth Story contributions into a blog, www.geopoem.com that helped illustrate some of the things that our first year undergraduates were covering, in an attempt to interest just the seven students in my tutorial groups. Others started reading them and seemed to be enjoying them. I was encouraged by the positive comments. Things happened by chance, rather than design, as seems to be the pattern for most of my life! Two or three weeks in a row the Departmental Administrator sent out a general email pointing out the opportunities to take part in the British Science Association’s Media Fellowships. I assumed that, because the emails were going out and the closing date was approaching, they must be short of applicants (it turns out that this is far from the case!). I looked at who had been Media Fellows in the past and saw that some old codgers like me had done it, as well as the younger bloggers and aspiring science communicators who I had assumed would be most interested. In fact, the scheme exists to try and bring journalists and scientists together, by working side by side, to inform both science and the news media, rather than to act as a sort of internship programme. Anyway, at the very last moment I threw my hat into the ring and waited to see what fate would bring. It turned out that I was offered the fellowship with BBC over the summer, which has been a fantastic experience. You’re currently participating in the British Science Association’s Media Fellowship with the BBC, what’s been the biggest highlight? Wow, another hard question. There have been so many. One of the most nerve wracking moments was in my very first week, when I was working with the BBC Science Radio folk on a couple of productions, one going out on the BBC World Service and one on UK domestic BBC Radio 4. The latter was a show called “Material World”, and I was involved in the very last edition of it. It went out live each Thursday at 16:30, and being involved in live radio, even as a minor researcher for only part of the programme was fascinating. The topic of “my” bit of the show was communicating scientific uncertainty and my contribution amounted to telephoning potential guest interviewees and getting them to agree to sitting in front of a microphone. When faced with attempting to write a script for how I believed the discussion would proceed, I had to rely on the answers that they had given during my phone conversations with them earlier in the week. Needless to say, I hadn’t been paying such careful attention at that point, because I hadn’t realised the importance of the phone calls. I waited on tenterhooks during their part of the programme, terrified that the interviewees would go wildly off message and sink the whole discussion. But they were closer to the topic than me, and did an excellent job of discussing a difficult concept. The presenter, Gareth Mitchell, was fantastic, and it was a highlight watching him guide the show so professionally and calmly, winding it up at 16:59:59.7 in perfect style. 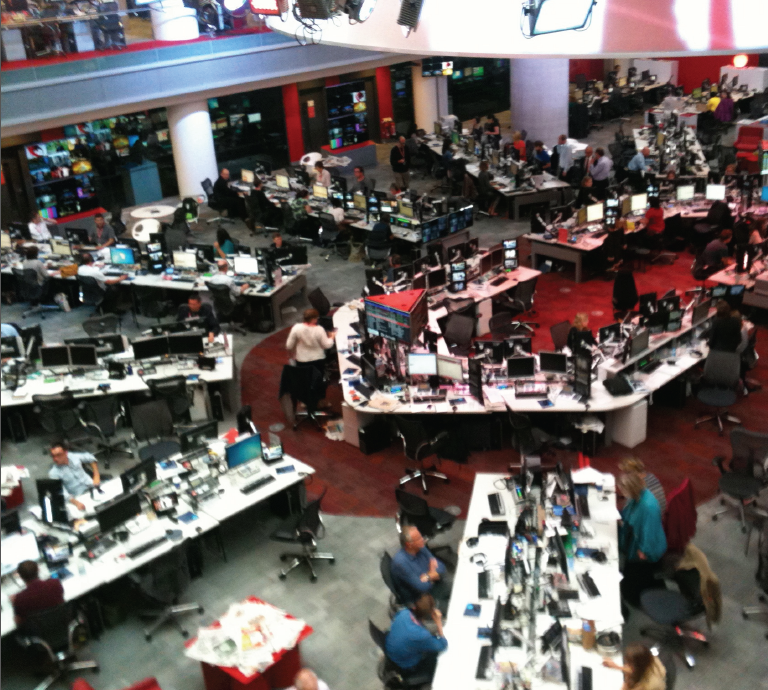 Inside the BBC – a hive of activity! I spent three weeks working with Science Radio and three weeks working with the Science and Environment page of BBC News Online. Seeing your words transformed from hastily scribbled reports of the latest research papers, into slick pieces on the BBC News Site was great fun every time. I ended up covering topics as diverse as dark matter, neutron stars, 4 billion year old resurrected proteins, bears in Yellowstone and new remedies to fight MRSA or anthrax. Sometimes I had the luxury of writing about something I actually knew a little bit about, which included a fun story about how sand dunes were engulfing the star wars set in Tunisia. Seeing my story on Dune vs. Star Wars hit the most read item of the science pages for four days in a row was only surpassed by seeing it appear as the most read article across the whole BBC news site overall, beating a story about Jay-Z changing his name into second place! Have you had to deal with any sticky situations on the job – if so, how did you keep your cool? The only sticky situations I had to deal with were of my own making. We shall ignore the instance of me spilling a cup of coffee down my front as I made my way to my very first day in the office (what is it that they say about first appearances?). My temporary colleagues at the BBC were so professional and expert in all that they did, it was a pleasure to spend time with them, and I really enjoyed every moment I spent at New Broadcasting House. But my worst moment was when I went off to the Royal Society Summer Exhibition, a festival of science held at the Royal Society’s splendid accommodation in the centre of London. The summer exhibition is a chance for a few selected research projects to showcase their science to the general public. I took a BBC Marantz sound recorder, microphone and headset and conducted some interviews for potential use on the radio in the coming week. Only when I returned to the office did I discover that the flashing red light on the Marantz means that it is on “standby”, not “record”, and all my fantastically crafted questions and the even more splendid responses had failed to make it to memory. Bother. But, they say that we learn by making mistakes. I certainly know how a Marantz works now. 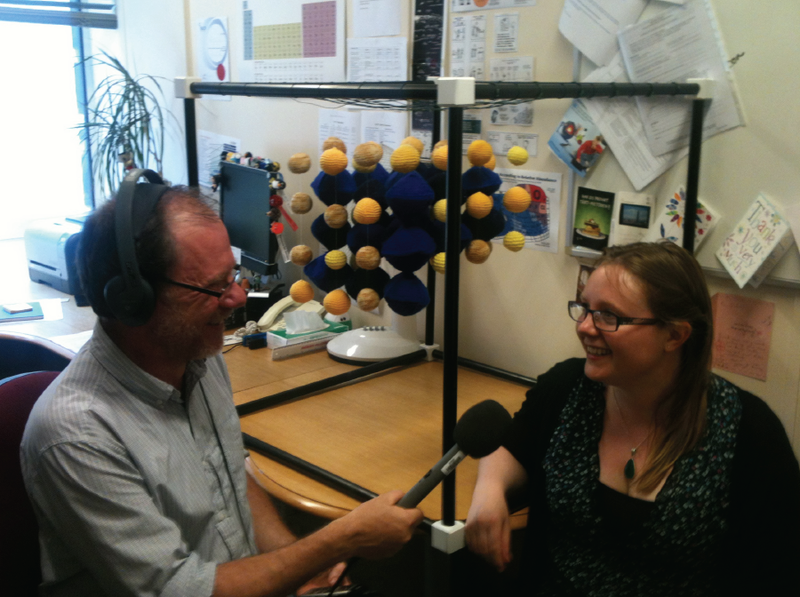 Simon interviewing Dr Julia Percival about a project to knit perovskite. Find out more about the Perovskite Project on An Atom’s-Eye View of the Planet. How do you balance science writing with a hectic academic schedule? Well, so much of what we do is via the internet these days, during my media fellowship I was able to keep most of my research work ticking over while doing a daily commute to London. Actually, I found some advantage in working in the centre of London, arranging a few lunch meetings with London-based colleagues and ex-students to catch up on their work and make contact again. My research students in Cambridge certainly saw less of me than is probably ideal, but I did pop into the Department in the evening on my way home from the train station a few times during the BBC placement, just to keep that going. And I took a week off at the middle of the BBC stint to go and do some experiments at the BESSY-II synchrotron in Berlin, where I was working on some X-ray microscopy of carbonate shells using a spectroscopic method called PEEM. So, I had a sort of academic sabbatical from my journalistic work, with one week of science amid my six weeks of media fellowship. Actually, it was great to be working at the synchrotron for a week, and to remind myself of the fun of seeing data accumulate in an exciting experiment. The rest of the time, the science writing clearly comes lower down the list than my other priorities – research and teaching are my main responsibilities, alongside a little bit of science management, which is difficult to escape from. But I try and combine the science writing when I can, so my Earth Story stories still help me think about how to liven up my tutorials and teaching for my first year students, and writing blog posts remains a fun hobby that helps me keep abreast of what’s going on in terms of current events and ideas in the bits of science I enjoy most. I recommend it! Sometimes it is possible to combine the writing and academic schedule in other ways. 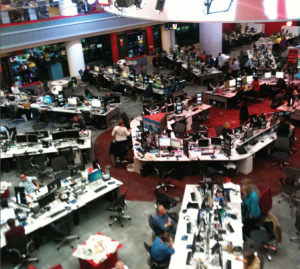 I had a go at blogging, and reporting for the BBC, at the Goldschmidt meeting this summer. It turned out to be much more difficult than I had suspected it would be. Keeping on top of making use of the meeting for my own scientific interests, and reporting on it for the general audience was a tall order. Both activities can consume all of your time, and keeping a balance is a priority. One indication of the difficulties is probably my delay in getting around to answering these questions. It is now over a month since I was asked to respond! Simply a reflection of the difficulties in making time for everything. Do you have any tips for budding science writers? Just write. The more you write, the easier it becomes. Maybe start a blog on something that you really care about. But I have found it also useful to have a purpose. For me this was, initially, the teaching, then more general self-interested “learning” aspects, and also the “publicising” side of getting my own research interests in front of a wider general audience. A lot of people love reading about science. Science news gets good responses in many outlets. But it is helpful to know your audience. And here’s a practical tip – if you use Microsoft Word there is a little-known tool that analyses your prose and works out what reading age it corresponds to. Most news media aim for output at around reading age 12, I reckon. That will, in any case, give you an idea of how to simplify your language; if you feel you need to. If you want stuff published, then pitch it as an idea (an abstract of what you are aiming to cover/say) in a brief email – most journalists do not have time to read long messages! I would suggest that if you want to give science writing for a general audience a go you find your local news site/community radio station/research news bulletin and try and get them to bite. And if an opportunity like the British Science Association Media Fellowships comes up in front of you… go for it! I’m a Geoscientist – Get me out of here! Apply to take part in our 2014 launch event!